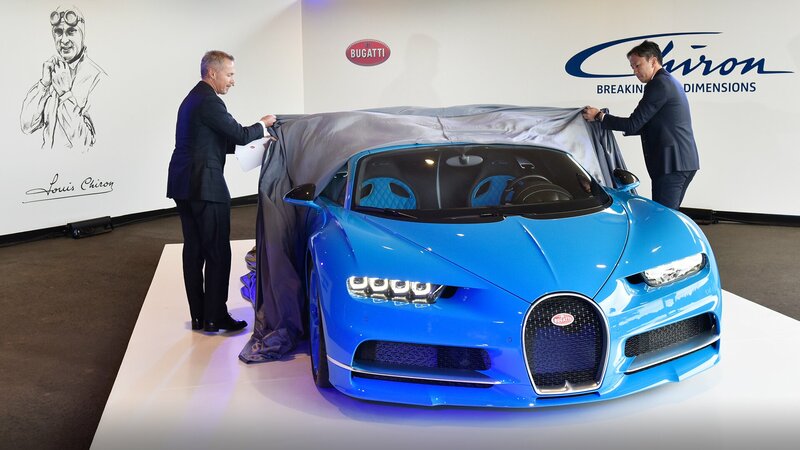 Curtains up in Japan for the Bugatti Chiron. After its premieres in Europe, North America and Singapore, the world’s most powerful, fastest, most exclusive and most luxurious production super sports car was unveiled in Tokyo today. Bugatti and the AOI Group, the French luxury brand’s partner in Japan, are also presenting the Chiron to VIP guests at exclusive private appointments. The Chiron can be viewed in the showroom of Bugatti Tokyo until 16 November and will also return to the Japanese capital in time for Christmas. Japanese customers appreciate the products of European brands with a great tradition. The combination of history and luxury represented by Bugatti enjoys the highest level of recognition in the Land of the Rising Sun. Over the past few years, Bugatti secured many customers in Japan with the Veyron. Of the total of 450 Veyron sold, more than 10 are owned by Japanese customers. With the new super sports car from Molsheim, the Chiron, Bugatti has already exceeded total sales of the Veyron in the country in the advance sales phase. About six percent of orders received for the Chiron have been placed by customers from Japan. “In the AOI Group, we have a partner which provides our exclusive clientele in Japan with the highest levels of service and is developing our business in Japan with the maximum expertise and passion,” Brungs added. Akihiro Yamamoto, CEO of the AOI Group, said: “we are proud to represent the Bugatti brand in Japan. The Chiron has been eagerly awaited in Japan both by Veyron owners and by potential new customers. It is a great honour for us to present this exceptional super sports car." The AOI Group, Bugatti’s official dealer and service partner in Japan since 2014, has been active in automobile business for over 50 years and has gained considerable experience in the sale of European premium and luxury vehicles. Bugatti Tokyo opened its vehicle showroom together with an independent Bugatti Lifestyle Boutique under one roof a year ago. In addition, the company plans its own service centre to provide the highest levels of support for customers and vehicles in the region. Monday and Tuesday: 11 a.m. to 7 p.m.
Japan premiere for the Chiron: Dr. Stefan Brungs, Member of the Board of Bugatti Automobiles S.A.S. for Sales, Marketing and Customer Service (left) and Akihiro Yamamoto, CEO of the AOI Group, unveil the Chiron in Tokyo. © 2016 Bugatti Automobiles S.A.S.